What a treat! As I was channel surfing among the news networks last night (around 9:30 p.m. PDT), I came upon Fox Business News (FBN) at the exact moment they took up the topic of teacher evaluations. I don’t know the name of the anchor, but there was an interview with Terry Moe of the Hoover Institution. Moe has done extensive research and writing about unions in American education, and I believe he understands the situation more thoroughly than he had opportunity to share on Fox last night. As a service to him and anyone else interested, I offer this blog post as a counterpoint to the newscast, filling in the missing information, correcting the mistakes, and qualifying the over-generalizations. First of all, the trigger event: Washington D.C. Public Schools fired over 200 teachers this year, based on results from its IMACT evaluation tool. The Fox Business News anchor states, “Chalk one up for states and cities in the union battle – the union budget battle, that is. Some are finally booting teachers who are getting low grades.” So, right off the bat, the frame is not whether or not this development helps education, but rather, the implication is that cities and states are better off because we assume the fired teachers earn more than their replacements, or the unions will be weaker and less successful in contract negotiations. Terry Moe was asked how widespread the idea of pay for performance has become, and he responded that it’s spreading widely “because it makes so much sense.” (Never mind that it’s failing almost as often as it spreads). Moe contrasts this idea with a straw man school system “in which no one is evaluated based on performance, in which no one ever loses a job simply because they’re bad at what they do, and where everyone is paid based on criteria that have nothing to do with whether they’re good employees.” In this opening, Moe exaggerates and distorts considerably. Moe doesn’t define performance, and so you’d have to wonder, “Gee, what’s on a teacher evaluation?” My evaluations have certainly focused on my performance in the classroom, and I think that’s true for most teachers. I think what Moe intended to say is that teachers are not evaluated based on student performance on standardized tests, and he’s comfortable using those tests as a measure of teacher performance. I would even agree with Moe if he pointed out that many evaluations take a rather cursory view of teacher performance, and then provide little if any guidance or use for improving teaching; I’m no defender of the status quo! Of course, the “no one ever” statement is patently false, and I wish that someone of Moe’s stature wouldn’t resort to statements like that, because it affects one’s ability to take the rest of his comments as seriously as we might. The FBN anchor asks Moe why teacher unions are pushing back and saying this approach doesn’t make sense. This man doesn’t know any better, perhaps, but Moe should: the push back is not only from unions. The push back is from educators, parents, researchers, and a variety of policy analysts, think tanks, and experts in educational measurement. Unfortunately, Moe doesn’t correct the assumption that the pushback is strictly a labor issue, rather than a teaching and learning issue. He then distorts the main arguments against the use of test scores for teacher evaluation: “I think their main argument is that test scores are invalid means of assessing student achievement (true statement regarding most state tests, and true argument), therefore they’re invalid means of evaluating teachers (true regarding validity, partly true regarding argument), and therefore they whole thing is unfair to teachers (unnecessary statement intended to inflame).” Moe distorts the issue somewhat in his second step. Even if you have a test that provides a valid measure of student learning, you do not necessarily have a valid measure of teaching – for the simple reason that you can rarely isolate the effect of the teacher on the learning. There are also issues of sample sizes and comparing different students, different years, taught in different ways and tested under different conditions. (Not just my opinion – review the experts). And finally, Moe tilts the argument by saying teachers are against this invalid idea because its unfair to them. Well, sure, that’s a great reason to be against the policy, but we’ve got it covered at invalid tests or invalid use of tests. That’s reason enough to stop the madness right there, but Moe wants to make us sound thin-skinned, or selfish, for worrying about what’s fair to us – as if a system that botches teacher evaluations could somehow still be good for student learning. Then, he offers a false choice: “The response to [‘union’ arguments] is ‘so what? We don’t evaluate teachers? '” How blithely his dismisses the invalidity issue! Given more time, perhaps he would have placated us many others have by saying, well, we’ll only count it for 30% or some other arbitrary portion of the evaluation. Of course no responsible player in this debate suggests doing away with evaluations. Moe: “For the past thirty years, teachers have not been evaluated seriously. More than 99% of the teachers in this country receive satisfactory evaluations, and no one ever loses a job just because they’re bad in the classroom. This is just an insane policy for a nation that wants to have effectively organized schools, and something clearly needs to be done about it.” Again, “no one ever”? I mean, they invited him on the air because over 200 teachers just lost their jobs due to supposedly poor performance. Maybe they were the first teachers ever fired for poor teaching. (Of course, those teachers were largely compared to others using a test with compromised integrity and validity, which has this EdWeek blog wondering if the firings will hold up to scrutiny). As for the statistic “more than 99%”, I’ve never heard it that high as a nationwide figure, but I have heard that number consistently reported in the area of 97-98%, so I won’t quibble. However, there are two crucial pieces of information missing here. First, Mr. Moe, what should the percentage be? Are we off by 1%, or 10%? Leonie Haimson dissected some numbers used for comparing performance across professions in “Waiting For Superman”, and found other professions with numbers similar to “99% satisfactory.” But secondly, the teaching profession suffers from very high turnover, especially in the first five years of teaching. Are we to assume that those teachers leaving the profession are not effecting a bit of quality control for us? If we lose tens of thousands of teachers annually, doesn’t it stand to reason that many of them were ineffective? So, while Moe never says so directly, he implies that bad teachers among that 99% satisfactory just aren’t going anywhere, when in fact, many of them are. However, while we’re on the topic, maybe the folks at the Hoover Institution would like to help us address the fact that teacher turnover is a problem with real and negative impacts on education, and a fiscal cost in the billions of dollars nationally. (A report now over four years old estimated the cost of teacher turnover to be in excess of $7 billion – yes, B-illion). If I were the thin-skinned type of teacher and union member Mr. Moe imagines, I would be personally insulted by these characterizations that run in direct contradiction to my professional work outside the classroom. I guess I shouldn’t be surprised, but I’d like to think someone who’s spent years studying and writing about unions would have retained some of the facts that complicate the story he’d like to tell. If Moe had said “some” I wouldn’t have disagreed: some unions, some reforms. I would add that while unions have let us down by resisting some worthwhile reforms, they have also served us well by resisting some so-called reforms that ought to have been rejected. (With every new study undermining merit pay, every program that falls apart, and every cheating scandal, I feel like shouting “we told you so!”). Even if Moe had said “most” – well, it’s a criticism of unions that warrants a response. However, making such statements in false absolutes undermines the credibility of the overall argument. Perhaps in all his reading, Mr. Moe learned nothing about progressive teacher unions, the Teacher Union Reform Network, National Board Certification for teachers, or the numerous districts that have seen unions collaborate with school boards and administrators over the years to craft innovative approaches to teacher evaluation. 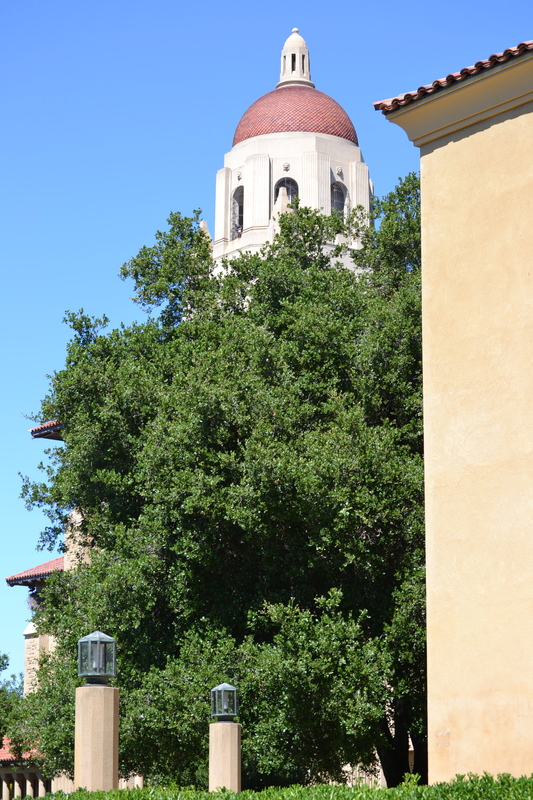 Perhaps I should walk over the Hoover Institution offices, only a short stroll away from Accomplished California Teachers headquarters, to deliver a copy of our teacher evaluation reform proposals. Still, if I had to take a guess, I don’t think any of this will change his mind. He’s decided on his single story of unions, and has his reasons to keep telling it as is, rather than complicate it with realistic complexities and ambiguities. And of course, this is all business news – not education news, so perhaps I’m working on the wrong narrative. It was never about teacher quality; it was always about how to undermine the union in this particular sector of public work. And tonight, on Fox Business News, I kid you not – Wisconsin Governor Scott Walker. Same story, next chapter. Just keep in mind, this is all about union power and politics, speaking of teaching and learning only in distortions crafted to serve an ulterior motive. * edits: corrected “Institute” to “Institution” (7/19/11 – DC). Thank you, David. A masterly piece. Where is it published–did you wend it to Ed Week? Column for NY Times? We all need to hear more fro you. By the way, is it bad practice to help someone “retire” rather than “fire”? Isn’t that an old sound business policy too? Shall we become more ruthless in the spirit in which we send people away from teaching? At Mission Hill a wonderful women, who was not doing well teaching even though we all liked her and she had a terrific science and math background, left us to become a doctor–and is doing very well! It took loving support to help her make that decision early in her career. I’m sure Moe knows all about this as a top right wing expert on unions. And he opposes it because the net result is to make teacher unions infinitely more powerful by embedding the voice of the practitioner in the policy and management of schools and districts. Moe’s argument is ultimately about management prerogative – the ability of administrators to do what they want without being inconvenienced by meaningful dissent. Wealthy reactionary business people are just smarter than the rest of us and we should just shut up and do as we’re told. Michelle Rhee says its OK for unions to bargain on wages and benefits (how nice of her) – but that’s not what progressive union leaders want to talk about. We want expanded scope bargaining that addresses how schools are run, how they are funded and how policy is made. And we want to wrest control of quality in the profession. That is real reform, as opposed to recycled performance pay and evaluation schemes that failed when they were tried in the business world twenty years ago. Right wing reform is about the concentration of power and money in the hands of the already successful. Real education reform is about people power – teachers, parents, and students uniting to drive decision making down to the level where the decisions will be implemented. Delivering a copy of your proposals may not be such a bad idea. 1. Thank you for your excellent dissection of this specious argument. We need more of this in the public discourse. 2. 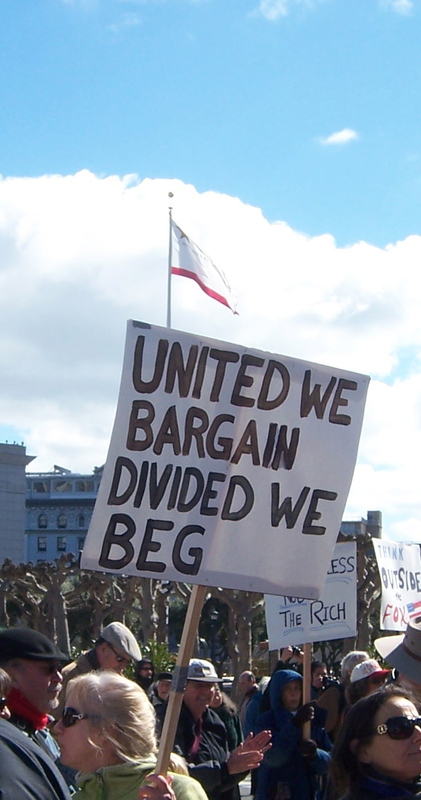 With regards to unions only bargaining over work-related issues such as wages and benefits: I’ve been told that in California state law forbids us to bargain over other working conditions, like class size or curriculum. Those issues are reserved for management. Is that true?